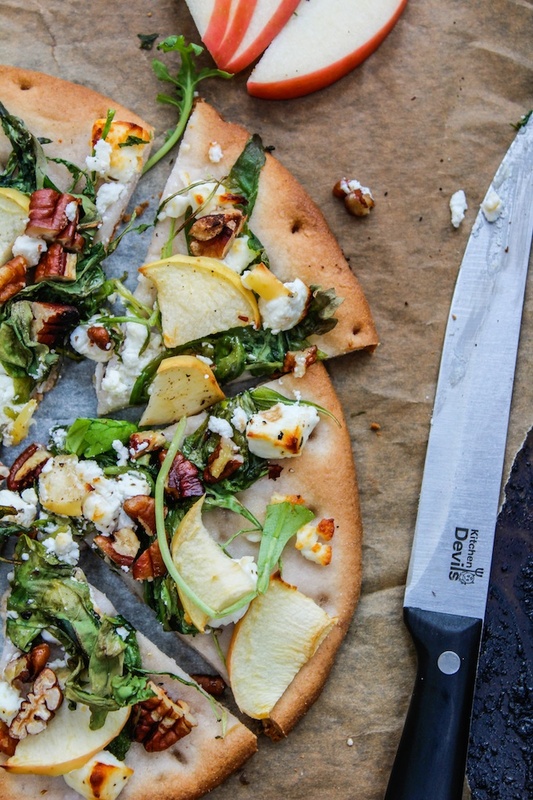 Simple, comforting ingredients come together to make this arugula, apple and goats cheese flatbread. Perfect for lazy days and quick eats. I’m all about making food fresh from scratch whenever possible, but sometimes if I’m being honest, I just can’t be bothered. I think this week especially is an ICBB (I Can’t Be Bothered) week – that was for you Monique. I’ve made it no secret that Mike requires a very specialized diet. Years of undiagnosed Coeliac Disease really put a number on him and it’s taking a long time for him to regain any normalcy in his health. We’ve had ups and we’ve had downs and have experienced a lot of general confusion and frustration, but little by little things are getting better…even if it’s been getting better at a snails pace. This week has been one of those down weeks. For whatever reason that remains a mystery to us, Mike’s stomach just can’t seem to settle down. Every meal is followed by pain and confusion which has left only the most bland of foods available to him until this particular issue passes. I think all the energy I would have otherwise spent making meals has been spent worrying instead. I know everything is going to be alright with him, but it’s never easy to see your loved one in pain. By mealtime I’m just so over food that I don’t want to spend a long time preparing anything particuarly fancy. Thank goodness for pre-made flat bread and simple ingredients. As I mentioned in my last post, 5 Ways to Reduce Waste, I’ve been working on….well, reducing waste. A quick peruse through my fridge alerted me of the arugula that needed using and the half apple that I had forgotten about from earlier that day. Going along with the fall theme I crumbled up a few pecans for crunch and some goats cheese because I just really happen to like goats cheese. This is basically just a salad on flat bread which suits me fine. Warm, crunchy, slightly sweet, and exactly what I need for a quick and satisfying meal for one. In times when life is feeling exceptionally complicated I try my best to remember to appreciate the smallest pleasures that make the biggest difference: warming my cold hands with a hot cup of coffee first thing in the morning, when Mabel (our cat) decides to jump up on my lap demanding attention while drooling all over the place, or just being in the kitchen and getting my hands dirty. Even the simplest of recipes like this cheers me up. Cliché, yes, but effective. It’s easy to be down about the current situation and the unknown future ahead of us, but above all else I feel lucky every day to be here in England with somebody that I care so deeply about. 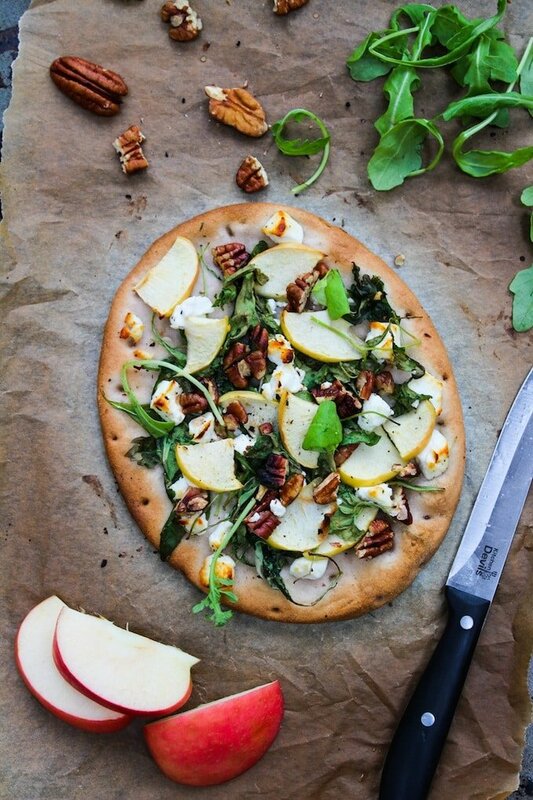 Place the flatbread on the middle of a baking tray and top with the arugula, apple slices, cheese and pecans and bake for 10 minutes. Top with additional salad and a bit of olive oil or enjoy as is. Ooh love that idea! Thanks Juliana! What a delicious and beautiful flatbread! Pretty enough to serve at a dinner party! Goat cheese is my absolute favorite! I guess it’s an acquired taste as my daughter gags even at the smell of it 🙂 Thank you so much for sharing with us at Thursday Favorite Things blog hop. I LOVE goats cheese – my husband can’t stand it which is fine by me because that I don’t have to share 😉 Thanks, for stopping by! Loving this, what an easy and gorgeous (and tasty!) dinner this would make! I love flat bread so much that when we have pizza I have to have the thinnest crust. As I have grown older I love that crunch and texture. I guess that’s why I am so excited about the prospect of eating this with the crisp apples and the crunch of the pecans! It is a dream come true! Thanks for sharing with Saucy Saturdays! I can’t wait to see what you make next! So sorry to hear about Mike not feeling well. I hope that things are on the upswing. I totally have those days/ weeks where I just don’t feel like cooking. This sweet and savory with the arugula really is a perfect, quick and tasty meal that I could go for on those lazy days. Thanks, Gabriel! Thankfully those weeks never stick around, and at least when they do pizza is involved! Love arugula in pizza! And this pizza is just calling my name. Not only the pics are gorgeous but this combination of flavors is just genius! It’s stressful when a loved one is suffering. Hope he feels better soon and gets the diet thing under control. 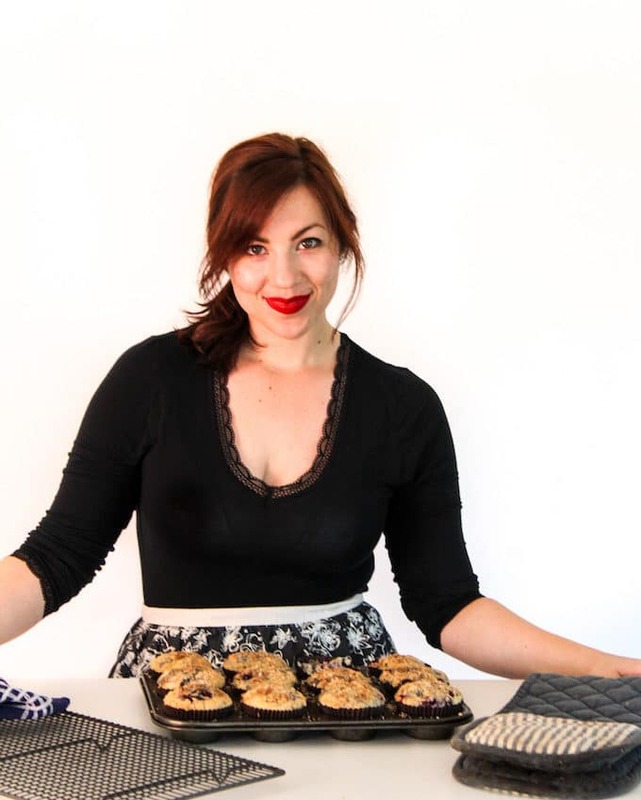 Your simple recipe sounds amazing and I love goat cheese too! Apples, goat cheese, and arugula combo is amazing. Thanks, Erlene! We’re getting there -slowly but surly. Looks great! I feel Mikes pain!! We cook from scratch whenever possible, it’s amazing the unnecessarily gluten and dairy they hide in processed foods! Good luck to you guys. Right?! I was surprised the first timeI realized gluten was a common ingredient used in poplar ice creams – never would have thought it would be in something like that. Thanks, Vicky! Right?! Great in salads, great in pizza – just great! Thanks, Dee! OMG this looks amazing! I would totally order this at a restuarant…Beautiful presentation and the ingrdients go so well together! Beautiful combination of flavors and so easy to make! Thank you! Arugula on pizza is great, isn’t it? Thanks, Sarah! Thanks, Beeta – you’re so kind! I love how easy, yet so pretty a good flat bread is! Apples and Goat Cheese are the perfecct combo! Looks so good! I want this right now! Our kind of pizza, without a doubt! Fantastic job with this one!! 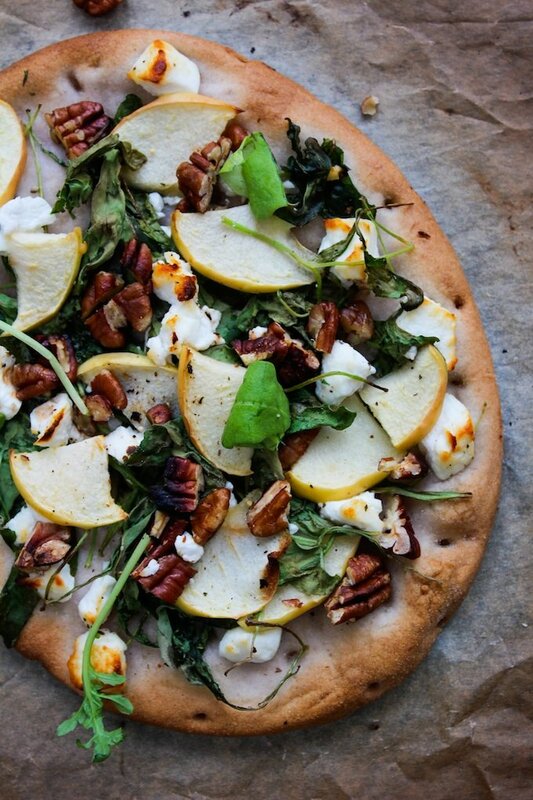 I like the idea of apples and goat cheese on a flatbread. I have to give this a try! Thanks, Julia! I hope you like it! This would be such fun party food! It looks gorgeous!